About the year 1816 the first Quaker Road School was built to serve the educational needs of the children living in the area. This school was situated on the north side of Quaker Road on Mr. R. S. Garner’s farm, lot 174. When a new school was built, the old log school house, complete with stove and pipes was sold to Livi Goodwillie for the sum of eight dollars. Records show that as of January 9th, 1861, Mr. Aaron Page was the secretary-treasurer of the school board, with Josiah Page having the chairman’s position. Trustees were elected for three years and the meetings were well attended. Early in 1861 four meetings were held to make plans for building a new school. On March 9th, 1861 plans were completed to build a school, 24 by 36 feet and 10 feet in height. In 1862 the new Quaker Road School was completed at a cost of about $1,000. This new school had benches, without backs, on three sides of the room. Water for the school was brought in from a neighbour’s well. To raise money for educational costs there was a small legislature grant, and a Clergy Reserve Fund, (which was a levy of 25 cents a month for a child attending school. ), there was also a local assessment on property. At times, money was borrowed from persons in the school section to help pay for the building. In the year 1863 votes were taken as to whether to have a “free school” which meant the abolition of the 25 cent monthly charge or continue on a “rate bill” basis. This same matter was voted on each year until 1871 when a Provincial Act was passed and made all public schools free. Hiram Goodwillie and George Page in 1872 wanted to make improvements to the school. It was agreed to buy four bolts, each one inch in diameter, and place them to provide additional overhead support. A lengthy discussion about the school’s condition took place but plans were held over because of the high cost of making improvements. The years rolled by and in 1893 a third school was built of red brick. At this time, J.L. Page was secretary-treasurer of the board, with Jacob Trumm and W.H. Garner as trustees. Around 1919 or 1920 attendance increased and more classrooms were needed. It was decided by the ratepayers to remodel the school with the addition of one classroom, a teachers’ room and lavatories. In June 1925, the remodelled and enlarged school was opened at a cost of about $15,000. An additional one acre of land was purchased from F.J. Dennis for $200. At this time the school trustees were John G. Hill, secretary-treasurer, J.W. Heffner and E.F. Shute. The school architect was N. Kearns, J.W. Marshall was the school inspector during this time. With industrial growth taking place in the Welland area during World War II, many new homes were built in this school’s section. Under the Veteran’s Land Act a group of war veterans built on a site near Stop 17, now called Summerlea Subdivision. As a result, Quaker Road then passed from an agricultural area to an urban one. With many new families coming to this area, the need was for more new classrooms. Early in 1950, the ratepayers voted $76,000 for an addition to the present school which was to be remodelled. The work was completed in 1952, and the addition consisted of two new classrooms, and an auditorium, wider halls and new storage rooms. John Cyopick, Harold M. Rice, Gordon McCoombs and secretary-treasurer Lloyd Rice, were the trustees at that time. One acres of land was bought from Claude Dennis for $1,000.00, increasing the school grounds to 2 3/4 acres. In 1995 the existing Quaker Road School was opened. 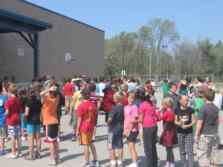 The school brought together those students at Quaker Road School and Lloyd Rice School into one building. Teachers from both schools had the opportunity to share their insights on what the school needed as it was being designed. The current building has a corner stone from the old Quaker Road and Lloyd Rice buildings.